Orlando Visitor: I'll Hide You Fnd Me! 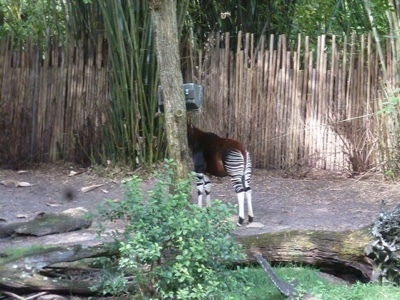 This is the Okapi, one of the many animals you can see on the Kilimanjaro Safari at Disney's Animal Kingdom, Walt Disney World Florida. The Okapi, native to the rainforest of central Africa has stripes like a zebra, body like a horse and yet is most closely related to the giraffe! Labels: Okapi. Walt Disney World. Orlando. Florida. Disney's Animal Kingdom. Kilimanjaro Safari. Theme Park Attraction.